Are you frustrated in your present season? 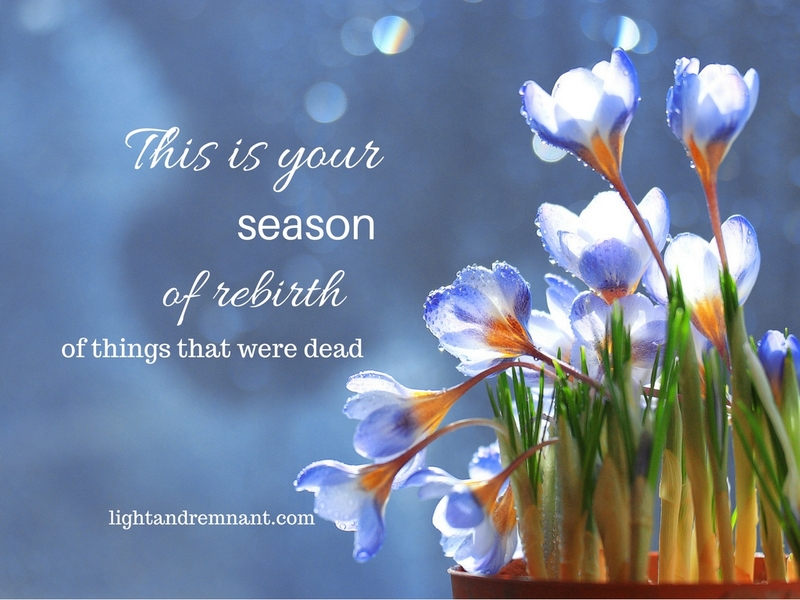 This is your season of rebirth. We are called to understand the times and seasons. This is a time and season of rebirth in the natural as it is in the supernatural. Things that have been dormant, even dead, are springing to life. Not the old thing reborn, but a new thing. Do not speak out what you see in the natural, declare and call out what is in the supernatural. That is the rebirth. The time of renewal is here. This is your season of rebirth. To walk in and receive this is the simplest, yet sometimes hardest thing for us to do. If you feel you have been contending for a breakthrough that doesn’t seem to ever come, do not despair. The secret is to enter the “tabernacle” of His Presence and sit with Him. This isn’t a formula. It’s not about setting aside a longer time in prayer, or a few praise songs. Instead, it’s when we enter into His Presence to simply BE with Him like Joshua from the days of old. When he followed Moses into the tabernacle to hear from God, Moses left with instruction on what to do next and his face radiated the glory of His Presence. But it says, Joshua remained after Moses left. “Inside the tent the Lord spoke to Moses face-to-face, as a man speaks to his friend. Afterwards Moses would return to the camp, but the young man who assisted him, Joshua (son of Nun), stayed behind in the Tabernacle” (Exodus 33:11 TLB). In that place where he sat in the Presence he was transformed to step into a role of leadership that was yet to come. He received his breakthrough and rebirth of who he was to who he was called to be in that place. When we enter into His Presence and sit with Him, we are transformed as well. It is where we experience rebirth in our present situation to walk in what and where He has called us. The trees, the flowers, the birds declare the time and season of renewal and rebirth. Join them today. Forth tell (create) by the words of your mouth as you come into agreement with creation and declare what He is declaring about you and bringing that new thing into your present.